Children in the Khazar IDP camp in the Kurdistan Region of Iraq. The United Nations Children’s Fund (UNICEF) today welcomed the release of 70 Kurdish children, who were kidnapped in May while traveling from their home-town of Ai’n Al Arab in the northern Syrian governorate of Aleppo to take their final school examinations. “The physical and psychological well-being of these children is currently being assessed. We remain deeply concerned about the safety of children and teachers who are still in captivity,” said Hanaa Singer, UNICEF’s representative in Syria in a statement today. The children were kidnapped on 29 May and held in captivity for 120 days. Ms. Singer reiterated that the abduction, recruitment and use of children in hostilities are grave child rights violations. “In this time of conflict, it is the obligation of all parties to ensure that Syrian children be kept out of harm’s way and granted unhindered and safe access to education,” she added. Meanwhile, a UN spokesperson briefing reporters at Headquarters today noted that since the adoption of Security Council resolution 2165 in July, the world body and its partners have sent 20 convoys of humanitarian aid through the border crossings with Turkey and Jordan at Bab al-Hawa, Bab al-Salam and Al Ramtha. These convoys have brought in food for 160,000 people, basic household items for almost 210,000 people, health and medical supplies for almost 470,000 people and supplies for clean water and sanitation for almost 67,000 people. He said UN Emergency Relief Coordinator Valerie Amos has welcomed the positive development that the humanitarian community can use these border crossings to reach communities in desperate need. But she added that the question is how consistently aid agencies can reach people, while security and funding remains limited. 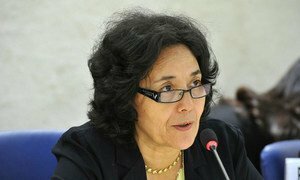 The United Nations Special Representative for Children and Armed Conflict, Leila Zerrougui today condemned the school attacks in Syria, which reportedly killed over 39 people, 30 of whom were children between age six and nine.